Thank You Dutch Bros.! Thank You Community! 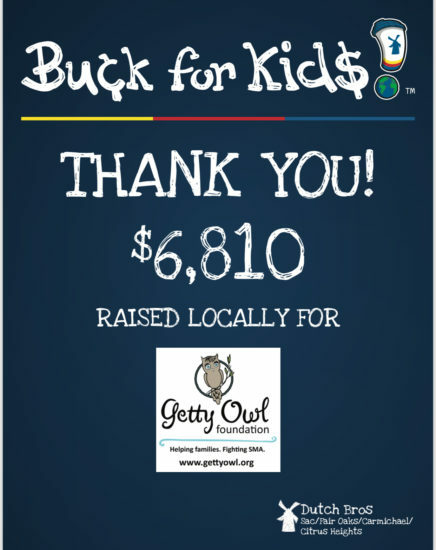 From Kate: I would like to wholeheartedly thank the Grubbs Family, Dutch Bros. Coffee, and our great Sacramento Community for helping raise $6810, in the Buck for Kids event on September 29th! It was a HUGE success and we are so thankful for all of the continued generosity of Dutch Bros. Coffee. Thank you for all that you do for local causes, such as ours. We are so humbled by your constant support and love. Thank you to all for stopping by and purchasing a drink, or two. We are so thankful! What I know for sure is that this holiday season we will be able to gift more iPads to deserving children and adults affected by SMA, and that makes our hearts sing! Thank you all! From Kate, We are absolutely heartbroken to announce that one of our incredible SMA warriors passed away this past week. GOF board member Shannon, and her amazing husband, Randy, said goodbye to their little lady Reagan. We mourn the loss of Reagan and we hope that with time, comfort will come to Shannon and Randy and their extended family. It has been difficult to put into words what has happened this past week. While all SMA children and adults are just the best human beings in the world, Reagan was a part of our innermost circle. With only a driving distance of forty minutes, we were able to have a more intimate relationship with the Sinkiewicz family. They are dynamic and fierce warriors for their Reagy. They dove into this abyss of what the SMA life includes and they just went in head first and never looked back. They brought the outside world to Reagan and she flourished. She was fulfilled, sassy, and extremely welcoming to anyone with her beautiful smile. Thank you Shannon and Randy for sharing Reagan with the world. Thank you for welcoming us into your home and giving so many people a chance to meet Reagan. Thank you for allowing others to gain knowledge and in turn gain a sense of empathy that perhaps they never had before. Reagan had such an infectious way of gaining attention. Her eyes drew you in the moment of meeting her. Her smile and coos were mesmerizing and she was such a force of persuasion. Her spirit beamed and you knew that all was right in the world when you were with her. We promise to forever care for you all. We promise to make sure that Reagan continues to be present in everything we do. We promise to make sure that our community who has held your lady in their thoughts, continues to positively make an impact. It was excruciating to get the news of Reagan’s passing. It was difficult to come to realization that Shannon and Randy will not have the ability to love on her physically anymore. They just relished in loving her and giving her everything possible to thrive. They created a world that was full of wonder and excitement. Knowing it has been stripped away, it just isn’t fair. We miss her and we are just so incredibly sad. Just so sad. To Shannon and Randy’s extended families we send our love and we stand with you during this time of grief. Reagan, your beautiful spirit is in all of us. I can only speak for myself, but I have a feeling there are many people throughout the world that are moving forward with a little more purpose to make this a better world. An increased purpose to make sure that everyone feels included. An increased purpose to make sure that your life and your story will continue to be told. I can’t tell you how many times we have been greeted by a curious hummingbird. They hover just long enough to say hello and then they are gone. I feel like it is your way of saying hello. One actually hovered near my face and it brought a smile, one that I had lost the last week. Thank you for bringing it back. If you would like to help support Shannon and Randy during this time, please consider donating to their fundraising page. Click HERE for more details. Back to School Giveaway Announcement!!!!!! From Kate: I would like to thank all of the awesome families who entered each and everyone of their amazing kiddos! I am so happy to report is that after the giveaway was announced, I had two really incredible donations that helped us up this giveaway from 6-14! People are just good and I would like to thank both the ever present and supportive, Bauernschmitt Family and Hunter Has Hope Foundation for their kind contributions to this giveaway! I hope to make this giveaway an annual event. We hope to increase the amount next year. 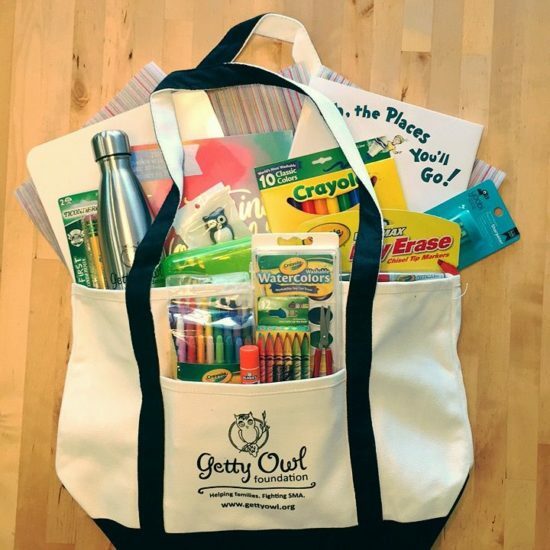 I would like to introduce you all to some really fantastic kiddos that will be receiving our “Oh, The Places You Will Go!” Back to School Giveaway. To all of our SMA kids, have a terrific school year and take life and your studies to new heights! Dr. Suess’s Oh, the Places You Will Go! From Kate: Getty started school on August 16th and she is loving 2nd grade! I will post an update about her first few weeks soon. As I was thinking about her starting school again, it got me thinking about the kinds of educational tools and supplies we have been using that have really helped her and helped us remain as organized as possible. Many times, school supplies do not completely support children that may have some physical challenges. Gripping, pushing, cutting, and lifting, to name a few, can all be very difficult for children with SMA. Luckily with enough time to explore, you can find just the right items for success. Once a SMA child enters the educational system, they are granted an Individualized Education Plan, or IEP. Every IEP is individually evaluated for that particular student. Without getting too far into the in’s and out’s of this, what may come of it are resources for this particular student. Scheduled meetings, evaluations, Physical Therapy, Occupational Therapy, Speech, etc. I guess what I am eluding to it appointments, lots and lots of appointments. I learned very early on that I had to write everything down into a calendar/planner or it would completely be lost within a minute in my head. 🙂 That planner goes with me everywhere now, absolutely everywhere. 🙂 Okay so this brings me to the GIVEAWAY part of my post. 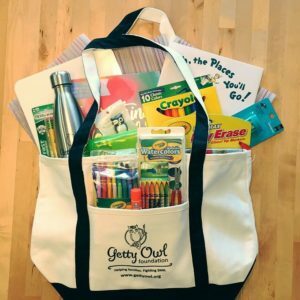 I want to help 8 SMA families with a few helpful items for their child’s first few years of school. -Twistable crayons and colored pencils. No need to sharpen or remove silly paper. -Adaptable scissors. Easy to hold and squeeze. -Flash Drive to save and modify files for IEP and correspondence records. -White Board and dry erase markers for quick communication and decisions making. -Calendar/planner to schedule appointments, therapies, doctor appointments, etc. -Watercolors, glue, pencil sharpener, markers, and pencil box. -I am looking for a particular demographic for this GIVEAWAY. I would like to help SMA families that just entered the school system. -So only SMA children entering: Pre-school Kindergarten 1st Grade *I hope to do another for older kids, but for now, just this demographic. Thank you. -One entry allowed for each child. Please include their name and grade they will enter. Please attach a picture so I can showcase them if selected. 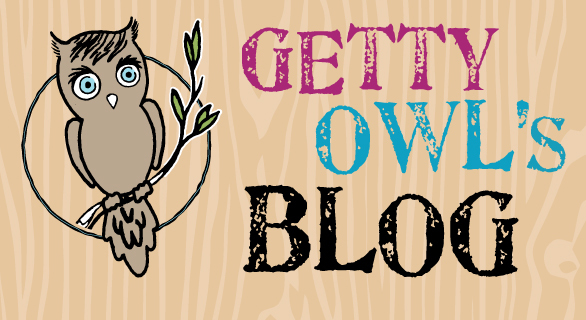 -Please email all information to hoot@gettyowl.org -Giveaway Recipients will be announced Tuesday, August 29th @ 6pm. Enter now! I will be using random.org to choose the 8 recipients. From Mark: If you’ve been following our journey over the past 7+ years, you likely know by now that August is Spinal Muscular Atrophy (SMA) Awareness Month. For others, well, it is. SMA BASICS SMA is a genetic degenerative neuromuscular disorder causing severe muscle weakness affecting the ability to move, swallow, and even breathe. The most common form of SMA is the most severe: Type 1, meaning affected children have never been able to sit unassisted. As the spinal motor neurons gradually fail, those affected become effectively paralyzed and lose the ability to eat by mouth within the first nine months of life. SMA is the #1 genetic killer of young children. 1 in 40 carry the SMA gene. The typical life expectancy is only age 2. There is no cure. GETTY’S STORY After being told in 2010 that Getty has SMA and that she would likely not live to see her second birthday, our visions of what her life — our lives — would be shattered. Devastated, we vowed to fight for her quality of life understanding that as long as she continued to smile, we would continue to fight. Some day she may let us know that she’s no longer happy and we can’t fix it, but until that day comes, we lovingly fight for her every day. We made the most of the 2 years we thought we were given. With the help of the SMA community, we learned doctors can be wrong — very wrong — about SMA care. We adopted SMA protocols and fought for different care options, some of which her doctors weren’t willing to provide at first. We had to find and present our own medical research to her doctors and appeal some medical denials. We won those battles to get Getty what she needed. Those two years with Getty have now become seven. Today, Getty is very happy and healthy, despite the limitations imposed upon her by her condition. She’s about to start second grade, attending school remotely from home using a V-Go classroom telepresence robot. She’s bright, smart, and sassy. We feared teachers might not want to accommodate her and her classmates might not want to associate with her, but so far, the complete opposite has been true. They love Getty, and she loves them back. We are very appreciative. This journey is fulfilling but hasn’t been, and still isn’t, easy. We operate under strict SMA and cleanliness protocols every minute of every day. This also means we provide Getty a couple of hour-long mechanical cough treatments daily, make her a special blend of amino acid liquid food, put her in orthotics and slings, change diapers, carry her to bathe, roll her wherever she needs to go, bring a small hospital setting with us whenever she leaves the house, and we do our best to bring her the world. Thanks to these protocols, Getty has been sick with a cold only once in 7 years (Summer 2011). Respiratory, nutrition, and mobility battles consumed the earlier years, then we had to overcome some education hurdles. Having secured her needs pretty well in these areas, our focus is shifting to her Spinraza treatments and her communication needs. SPINRAZA (NUSINERSEN) In December 2016, the FDA approved the first ever drug as a treatment for SMA. This has been fantastic news offering new hope to our community. Basically, Spinraza works by causing the SMN2 “backup” gene to make more high quality SMN proteins that are lacking in those affected by SMA. More quality SMN protein means more strength. SMA is degenerative, causing progressive muscle weakness, because motor neurons die off due to a lack of quality Survival Motor Neuron (SMN) proteins. Early intervention with Spinraza is key because while Spinraza may prevent loss of existing motor neurons, which would serve to maintain existing strength, Spinraza will not revive motor neurons already lost due to SMN protein deficiency and SMA progression. Spinraza is fantastic for newly diagnosed families! The question remains how much Spinraza can help “older” patients, like Getty, who have already lost motor neurons. Getty started Spinraza treatments, which consist of a lumbar puncture to administer 4 initial loading doses of Spinraza into the spinal fluid, then ongoing additional treatments of maintenance doses once every 4 months. Since starting Spinraza, Getty has had more strength and mobility in her fingers, hands, wrists, hips, ankles, and jaw. It’s thrilling to see her move in ways she hasn’t moved in years! Our most basic hope is to simply halt SMA progression. If she can just maintain her current strength, we would be delighted. Anything above that is a bonus. 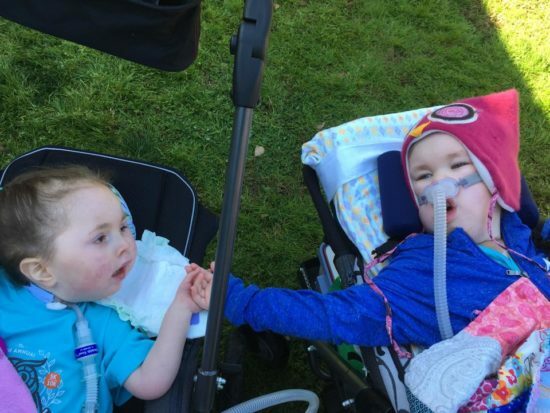 We are eager to see where these treatments might go, not only for Getty but the entire SMA community! One problem area with Spinraza is that doctors and insurance carriers might not see “stopping progression” as “enough” to warrant continued treatment at $125,000 per dose. Stay tuned! Many providers and carriers unfortunately have been denying treatments, forcing patients and parents to fight insurance appeals. Thankfully, so far, Getty has been receiving treatments and showing improvement! COMMUNICATION Getty is unable to articulate words very well due to a lack of muscle control of her mouth. We can tell her mood and figure out generally what she wants through her facial expressions and eye movements. She can also use her eyes to make binary choices as she is able to look at one thing or another to choose between them. She has a Tobii eye gaze computer, which is fantastic, but nobody to date has been able to train us how to properly use it to advance an appropriate curriculum for her. We want to incorporate it into her life as a meaningful communication tool. This device uses sensors to track her eye-gaze and convert those eye movements into computer mouse functions, like clicking on icons. The computer can then turn those eye movements and commands into words and sentences. If we can get this Tobii thing going, then Getty will be able to use it to fully express herself, and we can get a much better idea of what thoughts are really rattling around in her seven-year-old brain. This would remove a lot of the guesswork at to what she is really trying to say with her eyes and vocalizing hoots. We’d love to have full conversations with her! 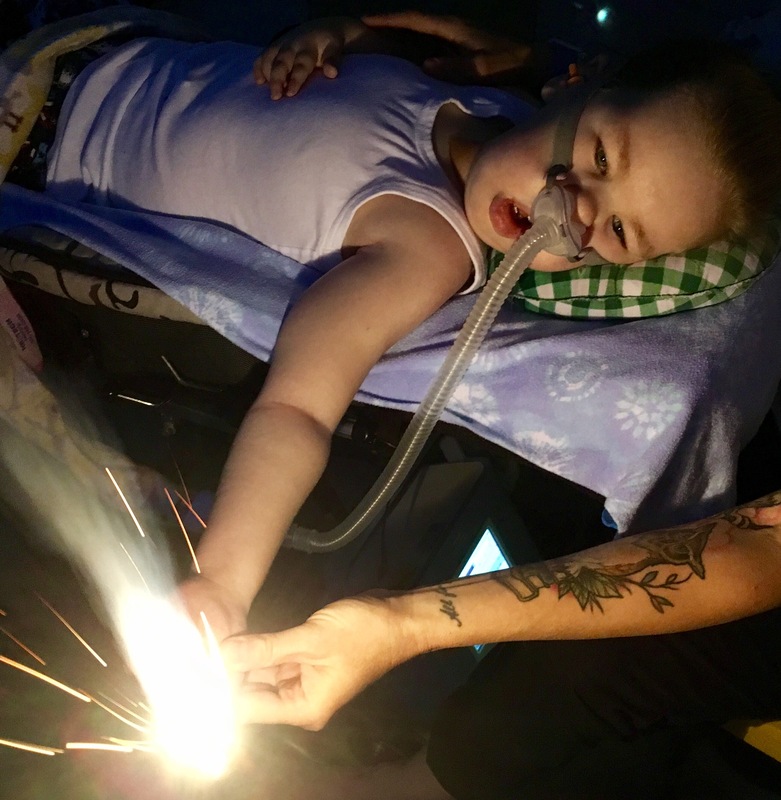 CANDLE LIGHTING Please join us tonight, the second Saturday of August, by lighting a candle at 8 p.m. your local time to remember and honor all SMA warriors and angels. Please help spread the word about SMA and encourage those considering children to ask their doctors about genetic testing. Thank you and have a great SMA Awareness Month!